It’s my fallen nature to blog about successes more often than failures. The balance with WCYDWT, though, is especially out of whack. I had a productive conversation with Jackie Ballarini at NCTM earlier this year that reminded me to rein in certain misconceptions. So I’d like to clear my throat here. I hope to assure you that I’m just as much of a hack as anybody with this stuff, though I’m a really happy hack. We don’t do WCYDWT every day in my classes. Most of my teaching strays only four or five degrees from the path beaten by my textbooks. We do a full WCYDWT unit — the kind of home run that I post here — perhaps once every two weeks. Naturally, that pace picks up every school year as I swap out old parts for new and as more of y’all do that hard work for me. We do tell mathematical stories every day, though they’re often brief. For example, we did a few problems with standard form lines last week. 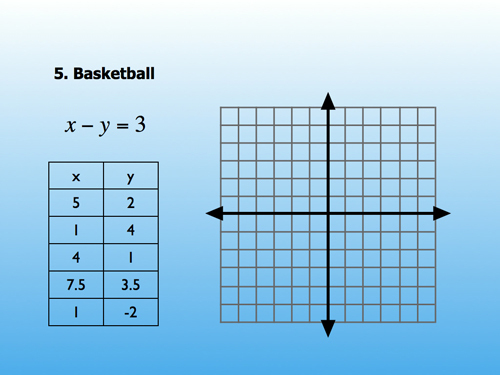 I put up an empty graph, a table of coordinate pairs, and a standard form equation. “Who is the imposter?” I asked. “Who doesn’t belong?” The students then had two methods (graphing or evaluating) for determining the villain. That’s probably the smallest unit of math storytelling I can offer. I didn’t shoot videos. I didn’t take photographs. I just reoriented my textbook’s existing activity towards drama. The home runs take a really long time. If I posted it on this blog, it took me (on average) three hours spread out over three weeks. Some take a lot longer. Most require research. For instance, I was in Chicago in early May with my family and we took a fantastic architecture tour. The tour guide offered me a gem of a WCYDWT idea so I interviewed him afterward. That led me to track down an expired building code from Chicago c. 1930. I’m now hunting down a book that’s out of print and absent from every public and commercial collection in Santa Cruz County. I can’t buy it. I can’t borrow it. I’m going to get it. I file this in my day planner under “leisure time.” The process exhilarates me. My teaching is my life, in the healthiest possible sense of the expression. I have a document in Google with a few hundred WCYDWT ideas. I add to it weekly. Most additions contain just a sentence and a link. Then I have several dozen folders on my Mac. Each folder contains images, videos, Photoshop documents, Geogebra applets, and other files contributing to a story from the Google document that had to be told in greater detail, a story that was compelling enough to demand more of my time and attention. 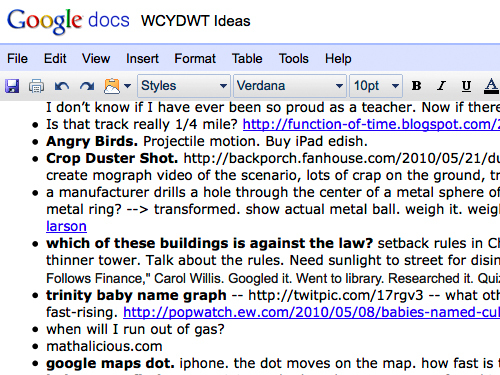 For every thirty entries in the Google document and every five folders on my Mac, I post one WCYDWT entry here. Of those three venues, the Google document is the most dear to me. It’s where I put inspiration. It’s how I convert inspiration into something, clearing it from my mental queue, freeing up room for more. This is what I want from betterlesson. The root ideas, and supporting materials. My biggest downfall is that I don’t see the potential in everything around me. Once it’s pointed out, I have my total “No Duh” moment, and I can pick up and run. It’s getting out of the starting blocks that’s the hurdle. After a bunch of people screw around with your ideas, you could get the kind of process map Jason talked about yesterday, to make it more accessible to people who aren’t comfortable mentally herding a bunch of different kids all going in different directions. There’s a potential powerhouse hiding in there. For now – off to make a file. You just got everyone on board. That’s the stuff everyone can do, not just the freaks. I dream of someday having “180 aces.” Right now I have a few Jacks and a lot of sevens. Question: what happened on April 15th that made you create an “antiwcydwt” folder? Mr. K: This is what I want from betterlesson. The root ideas, and supporting materials. My biggest downfall is that I don’t see the potential in everything around me. Once it’s pointed out, I have my total “No Duh” moment, and I can pick up and run. It’s getting out of the starting blocks that’s the hurdle. Good word. I back up to a external hard drive hourly and a remote server somewhere in Texas nightly. Luke: what happened on April 15th that made you create an “antiwcydwt” folder? I began to find it useful to catalog both rigorous multimedia math and multimedia that could be easily confused as rigorous math. Thanks so much for the insight into your brainstorming. One of the main reasons I began my blog this spring was to force myself to force the process of turning some of the “I could use that in class…” ideas I keep having into reality. I like that you say that many of your brainstorms are “a sentence and a link” This kind of thinking will allow me to keep track of many more ideas and then flesh out the ones that inspire me most or that seem to have the most potential to connect with my students’ lives. First you inspire by giving us something to reach for, then you put it into reach for a whole bunch more people. I was just at a combined 3/4 grade workshop this week and the teachers there were talking about the pressure they felt to abandon the text book entirely. Most of our crop of texts here in Ontario are about an 80% match to curriculum – why abandon what can support 4/5 of your program while you put your energy into creating wonderful stuff for the other 1/5 and adding meaningful narrative into the text? Personally, I’m moving up to a 3/4 from a 1/2 class where I’ve been creating 80% of my own material because our math resource doesn’t fit the needs of grade 1/2s who can think critically, nor is it integrated with other subject areas. I’m actually looking forward to a text book for a change even if it ain’t perfect. And now my wife won’t have to kill me for working most nights until 10 or 11 o’clock. Glad you’re backing up those hard drives! Your ideas will inspire maths teachers and students for generations to come. As an ex maths teacher married to a a Management consultant with a Masters in Math Modelling we can sit round the dining table with our 4 kids and ask WCYDWT questions from how many atoms are there in the universe to what does a further 10% off in a 50% sale really mean? I’ve just launched a blog to help parents support their kids maths, and am trying to think of ways in which non specialist but eager parents who themselves are a product of plug the numbers into the formula, can use WCYDWT ideas to get their kids excited about maths. Any thoughts? Congratulations on the doctorate! I am so happy for you and the future of teacher education! As for you missing teaching – consider leading a math club, a couple of hours a week, just WCYDWT work and nothing else, with kids and families who really want to be there. The energy it gives you is tremendous. This is gold. The best post yet. Reckon this is as good as I can do for you. That’s a good start – thanks so much! Thanks for inspiring me to be a better teacher.